Hair: Black, probably short but covered with a hood. Being over 500 years old, he had developed face-fur, and quite a bit too. Life history: Longbranch was one of the older Wolfriders during Bearclaw's rule. Longbranch was the howlkeeper, the tribe's storyteller, and was busy training Pike to be a howlkeeper as well. Why his name was changed from Longreach to Longbranch is not known, but he was quite old for a Wolfrider, being born in Freefoot's time. Longbranch was eventually killed by Madcoil, together with his lifemate Brownberry. 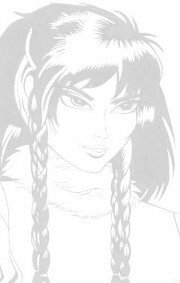 Elfquest art copyright 2001 Warp Graphics, Inc. Elfquest, its logos, characters, situations, all related indicia, and their distinctive likenesses are trademarks of Warp Graphics, Inc. All rights reserved.